It’s a privilege not all countries offer their citizens. In our great fortune, our country does offer this privilege. So why, when someone gets notice of jury duty the first thing they want to do is “get out of it?” People try obtaining Doctors’ notes with excuses such as, “She cannot serve on jury duty because the hangnail on her left thumb is under strict observation for signs of infection.” These jury duty escapees attempt being excused because they are desperately needed somewhere else. Anything in their lives is more important than serving on a jury. “Too busy.” “Conflict.” “ Not now; I have a headache,” oops, that last excuse is for getting out of something else. Once I was called for Jury Duty and, having never encountered the experience before, went to serve on my assigned day and time. I would be a good citizen and fulfill my proper citizenly responsibility. And I would surely learn valuable life lessons to boot! All prospective jurors were seated in black metal folding chairs in a large empty auditorium, waiting to be told what to do and where to go. 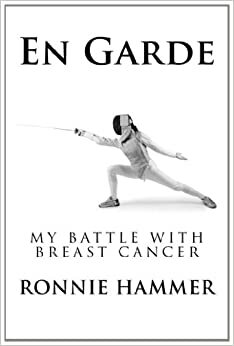 In front of the room were three fully armed police officers, pacing up and down the aisles. That gave a rather less than welcoming feeling to a room of well-intentioned citizens there to support our free society. At 9 o’clock A.M. sharp, a spokesperson addressed us. ‘You are required to stay seated until you’re called. If your name is called please rise and follow me. Otherwise, stay seated where you are now. There will be an hour break for lunch at noon, and you will return here until dismissal time, 4 o’clock.” This message was delivered in blunt and unnecessarily cold tones. I felt more like a prisoner of the state than a law abiding citizen willingly and freely serving my civic duty. My name had not been called yet, so I settled back and looked around to discover that I was among interesting but odd company. The man to my right kept gnawing at his left index finger. I wished I had a cuticle clipper and an emory board to offer him so he would stop that annoying crime against the defenseless cuticle. I shifted my gaze to the woman on my left. she had a motion thing going on with her leg. She sat with the right leg crossed over the left and relentlessly elevated that right leg up and then dropped it down; down; up and down and up. A choreographic symphony was going on in my very row. And it was making me dizzy. No matter how hard I tried I could not make the swinging leg stay still. And I couldn’t ignore it; I tried to avert my eyes, but it swung endlessly. The person in front of me was busy texting. She must have had a clever co-texter, because she kept bursting out in a high pitched cackle, indicating her amusement with her electronic pen-pal. Someone directly behind me was heartily chewing gum and snapping it in my ear. After a while I was dizzy from the swinging leg, deaf from the snapping gum and repulsed by the finger-munching molester. And that action was just from my co-jury pool of people. The presiding officers were intimidating, scary and nightmarish. After all those hours my name was never called. I was forced to sit in that one place all day. When it was finally dismissal time, I left gratefully, hoping that I would never again be called to serve on jury duty; civic duty be damned. 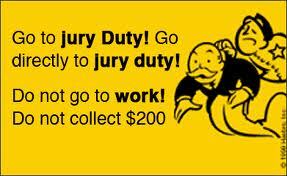 I’ve been called for jury duty several times but never served. Someone always objects to me saying that I know one of the people on trial. Since I taught in the area for years, I do know a lot of people. But we did not get the same harsh treatment you did while waiting. Oh, but did I forget to tell you that we respective jurors actually got paid for our service to the community? The amount of our salary was so surprising that I have trouble remembering how much it was. For the entire day the pay came to about Five dollars. When I did my compulsory Jury Service, it was for two weeks (here in the UK). I got called to sit on two juries, was a foreperson on one and had to bring in a guilty verdict, but the conditions were really good, the court ushers were really friendly, there was a canteen and a pool table, and things to do in the waiting around area. Your experience sounds awful. There was certainly no canteen and no pool table. Perhaps the UK could form a task force to show the rest of the world how to make serving on jury duty a pleasant experience! I kind of enjoy jury duty. Two experiences. 1. I sat on a jury in a drug trial which rendered a guilty verdict. 2. By the next time I had lost a lot of hearing and brought a doctor’s evaluation that I would likely miss some dialogue. The judge said sit anyway and see how the acoustics are. I did, but during the voir dire I was dismissed because it was a civil trial over a land dispute and I was a real estate paralegal at the time. Having said that, your experience sounds like a nightmare. All courts are different. Some actually treat you decently. I was looking forward to the experience, and understand that it could be an interesting one. I will hope for another outcome next time, like the one you had. What a nasty experience you had! I wonder if small town courts are different. My experience here was very pleasant, no auditorium and no police monitors. Most were dismissed first and only some were left. My name was called. I served and it was actually a fascinating experience. My town is very small and very cordial and easy in other aspects of life so I wonder if there is a difference in bigger cities. I’m glad you had such an interesting experience, Dor. There are millions of stories out there, and many of them must be fascinating. The small town experience like yours surely must be a different one. I once had to sit on an actual trial. The high drama in the courtroom, as depicted in movies and television, is largely non-existent. It’s business. All business. The sitting, the waiting, the watching people being bored out of their skulls, wanting to be anywhere else but where they were…they are the ones who decide the fate of our accused. Sadly, our judicial system is the best the world has to offer. You are right, and I’ve had similar experiences, but I will still go, if I am called. This country took me in; it is the least I can do for it. What a marvelous attitude, Dolly. Our country is lucky to have you! Oh, it’s the other way around: I am lucky to be here and grateful to this country for taking me in. What a sweet thought, Dolly. Our country is delighted that you’re here. My father, may he rest in peace, always insisted on celebrating Thanksgiving “the American way” and always made the first toast: God Bless America! (that was the first three English words he had learned).